Day 2 of Thanksgiving Leftovers. Time for another light antidote to the Thanksgiving feast…a turkey salad…with an asian twist – Nigella Lawson’s Bang Bang Turkey. It was great! Light, fresh, and full of flavor! Definitely will become a regular part of our post-Thanksgiving meals from now on! In a small mixing bowl, combine sauce ingredients with 2 tablespoons cold water, and mix until smooth. Cover and refrigerate until needed, up to two weeks. Spread lettuce over a large serving plate, and sprinkle with mint. Drizzle 4 to 5 tablespoons of Bang Bang sauce on top. In a small bowl, combine turkey with 4 tablespoons Bang Bang sauce, and toss until well coated. Arrange turkey strips in a rough line down center of salad. Top turkey with scallions and cucumber. Drizzle with more sauce, or place sauce in a bowl to pass at table. The Challah Project #14 – Sourdough Challah, It’s a Dinosaur! My wonderful husband bought me some sourdough starter for my birthday. I have made buckwheat hazelnut raisin flutes, which were wonderful. I decided to try a sourdough challah for thanksgiving weekend. I am using Maggie Glazer’s My Sourdough Challah from her book A Blessing of Bread. Since Cam was home when I made it, we made a dinosaur shaped challah (no, not a turkey, a dinosaur – such is life with a boy). It was not so easy, first the dinosaur kept tipping over, so I had to add stabilizers to the armature. Then the body kept drooping. (Lesson learned – only make shaped or 3D challah with doughs that do not need to rise or proof after building it). So, as it rested, I repositioned it and made a few changes, and it became more of an ankylosaur than an apatasaurus. I am very pleased with the almond eyes. Mix the Starter – The evening before baking, knead the starter into the water until it is partially dissolved, then stir in the flour. Knead this firm dough until smooth. Place in a sealed container that is at least 4 times as large as the dough. Let ferment at room temperature until tripled in size, 8 – 12 hours. Add the starter and knead until it is well combined and smooth, no more than 10 minutes. The dough is very firm and should feel like modeling clay, but it should knead easily. Clean and soak the bowl in hot water to warm it. Ferment the Dough –Place the dough in the warmed bowl and cover it with plastic wrap. Let ferment for about 2 hours, it may not rise much. Shape & Proof the Dough – For the Dinosaur – Create an aluminum foil armature – L shape. Divide the dough in half, divide one half into two large balls. Divide the other half into to medium and 2 small balls. Roll the 2 small balls into ropes for the legs. Roll the medium-sized balls into about 10″ ropes and the large balls into about 14″ ropes. Lay out the ropes with a long end hanging out each end (for the neck/head and the tail). Braid the overlapping portion together. Lay it over the armature with the head on the short end of the L and the tail hanging off the back. I used an almond split in half for the eyes. Cover with plastic wrap and let proof until tripled in size, about 5 hours. Heat the oven to 350F in the last 1/2 hour of proofing. Brush the dough with an egg beaten with a little salt. Sprinkle the body with sesame seeds. Bake for 35 – 40 minutes (for the 2 loaves, check it at 25 minutes) until nicely browned and cooked through. Cool on a wire rack. Enjoy! I had bought a locally grown cauliflower. These are so big that the quart of florets I used in this frittata only used 1/3 of the cauliflower. I really have never seen anything like the cauliflowers we have gotten this year, they are almost a foot across. To get the fullest flavor, this frittata takes some advance planning. The vegetables should be prepared earlier in the day (or the day before) so the flavors can meld well. This is full of great flavor! This will serve 6 – 8 as an appetizer or 3 – 4 as a main dish (which is how we usually eat our frittatas). Heat 1 tablespoon olive oil over medium heat in a heavy 10-inch skillet, preferably nonstick. Add garlic and cook, stirring, until it begins to smell fragrant, about 30 seconds. Add tomatoes with liquid, sugar, salt and basil sprig or thyme. Simmer over medium heat, stirring often, until tomatoes have cooked down to a fragrant, dry sauce, about 20 minutes. Remove basil sprig. Taste and adjust seasonings. While sauce is simmering, steam cauliflower 5 to 8 minutes, until tender. Remove from heat and drain on paper towels. Add to tomato sauce and break up into small pieces with the back of your spoon. If possible, refrigerate uncovered overnight or for a few hours. Beat eggs in a large bowl. Stir in salt (about 1/2 teaspoon), pepper, tomato sauce with cauliflower, feta, optional olives and herbs. Clean and dry skillet and return to heat. Heat remaining olive oil over medium-high heat in the skillet. Hold your hand above it; it should feel hot. Drop a bit of egg into the pan and if it sizzles and cooks at once, pan is ready. Pour in the egg mixture. Swirl pan to distribute eggs and filling evenly over the surface. Shake pan gently, tilting it slightly with one hand while lifting up edges of frittata with the spatula in your other hand, to let eggs run underneath during first few minutes of cooking. Once a few layers of egg have set, turn heat down to very low, cover (use a pizza pan if you don’t have a lid that will fit your skillet), and cook 10 to 15 minutes, shaking pan gently every once in a while and lifting up the frittata and tilting the pan to let egg run underneath. Frittata should be just about set, except for the top. Meanwhile, preheat broiler. Uncover pan and place under broiler, not too closeto heat, for 1 to 3 minutes, watching very carefully to make sure top doesn’t burn (at most, it should brown in spots and puff under the broiler). Remove from heat, shake pan to make sure the frittata isn’t sticking and allow it to cool for at least 5 minutes and for up to 15. Loosen edges with a wooden or plastic spatula. Carefully slide from pan onto a large round platter. Cut into wedges or into smaller bite-size diamonds. Serve hot, warm, at room temperature, or cold. Serves 6 – 8 as an appetizer or 3 – 4 as a main dish. Time again to use one of the butternut squash from my garden (somehow the crate of squash does not seem to be getting smaller). I peeled it and cut it up to use in a healthy chili. I love chili, all types of chili. Red chilis, white chilis, black bean chilis, leftover turkey chili, Cincinnati chili. Chili by itself, over rice, over spaghetti, with bread or crackers. Chili makes me happy. This chili is especially nice since it is so healthy as well as good tasting. The least healthy part, but necessary from my point of view..some cheese on top. While the chili cooked, I took the dog for a walk. The sun was just setting and the sky was a beautiful lavender shade, with a sliver of a crescent moon. 1 pound mixed dried beans, ( I used pintos and black beans), washed, picked over, and soaked for at least 4 hours or overnight in 2 quart pot. Place beans and soaking water in a large, heavy pot. Add halved onion and bring to a gentle boil. Skim off any foam that rises, then add crushed garlic and bay leaf, reduce heat, cover and simmer 30 minutes. Add salt and continue to simmer another 45 minutes to an hour. Using tongs or a slotted spoon, remove and discard onion and bay leaf. Meanwhile, heat oil over medium heat in a heavy skillet and add chopped onion. Cook, stirring often, until tender, about 5 minutes. Add a generous pinch of salt, stir in chopped garlic, stir together for 30 seconds to a minute, until fragrant, and add ground chili and cumin. Cook, stirring, for 2 to 3 minutes, until mixture begins to stick to pan. Add chopped tomatoes with juice, pinch of sugar, and salt to taste. Bring to a simmer and cook, stirring often, until tomatoes have cooked down and mixture is beginning to stick to the pan, about 10 minutes. Stir in tomato paste dissolved in water and bring back to a simmer. Simmer, stirring often, for 10 minutes, until mixture is thick and fragrant. Stir tomato mixture into beans. Add winter squash and bring to a simmer. Taste and adjust salt. Simmer, stirring often so that the chili mixture doesn’t settle and stick to the bottom of the pot, for 45 minutes. Add more water if chili seems too thick. Stir in corn and simmer for another 10 minutes. The beans should be very soft and the chili thick and fragrant. Taste and adjust seasonings. Shortly before serving stir in cilantro. Simmer for 5 minutes. Spoon into bowls. If you wish, top with grated cheddar, Monterey jack, or crumbled queso fresco. Serve with biscuits or cornbread. Enjoy! Last year, once again, we had a turkey that was raised and slaughtered within 10 miles of our house. It doesn’t get much fresher than arranging the day you will pick up the turkey and having it freshly slaughtered that morning. Instead of brining, I like Ina Garten’s approach of salting the bird and wrapping it in plastic wrap for a couple of days and then leaving it uncovered for a day. I have had good success with this simple approach. For flavoring I used Bobby Flay’s black pepper-pomegranate molasses glaze. It is a strange combination of ingredients: pomegranate molasses, horseradish and dijon mustard. The turkey and oven were not very cooperative. After realizing that at some point the oven had turned off, all timing was thrown off. The turkey ended up needing to be cooked a whole lot longer than it should have. But somehow, it still ended p delicious and, surprisingly, very moist. Two or three days before you plan to roast the turkey, wash the turkey inside and out, drain it well and pat it dry with paper towels. Sprinkle 1 tablespoon of salt in the cavity of the turkey and rub 2 tablespoons on the skin, including under the wings and legs. Place the turkey in a shallow dish to catch any drips and wrap the whole dish tightly with plastic wrap. Refrigerate for one or two days. The day before you plan to roast the turkey, remove the plastic wrap and leave it in the fridge. The skin will dry out and turn a little translucent. Whisk together pomegranate molasses, horseradish, mustard, salt, and coarsely ground black pepper. Set aside and let sit at room temperature for at least 30 minutes before using to allow the flavors to meld. 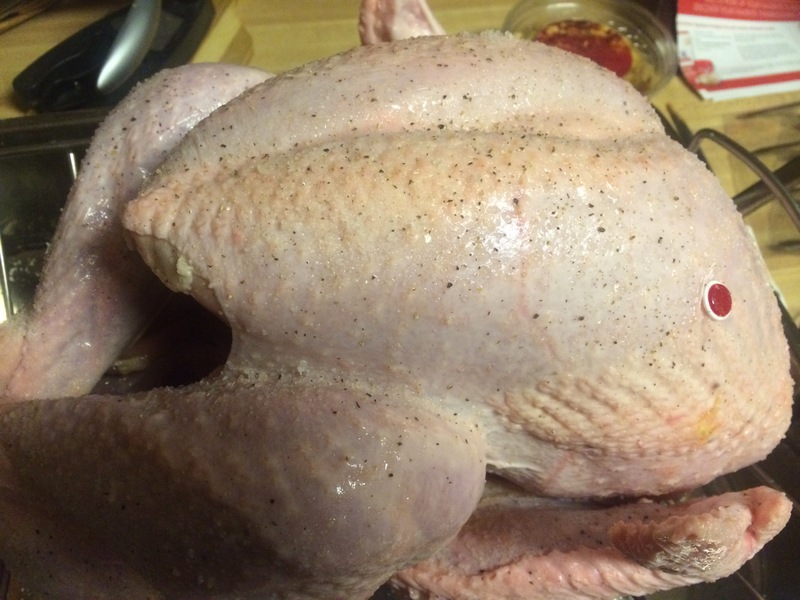 Rub the entire surface of the bird with the butter and season well (including the cavity) with salt and pepper. Truss the turkey and place breast-up on a rack in a large roasting pan. Roast for about 45 minutes, until slightly golden brown. 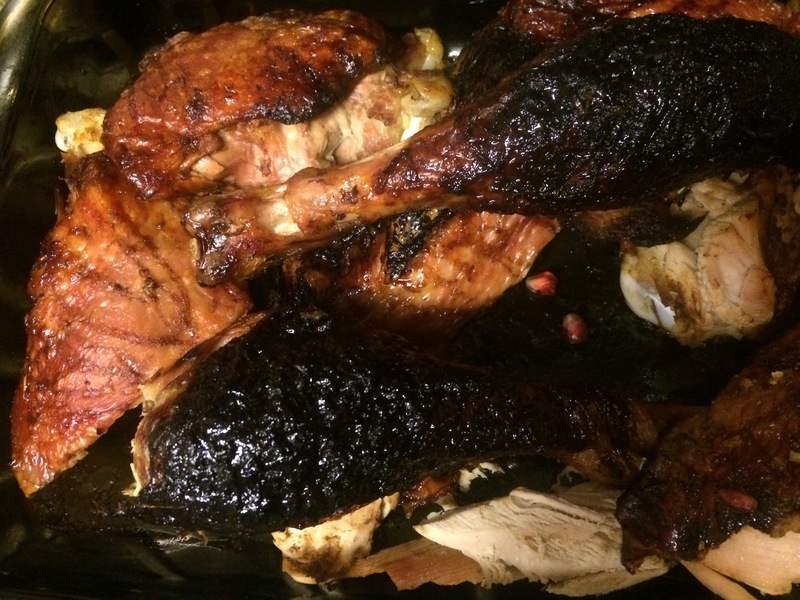 Reduce the heat to 350 degrees F and continue roasting, basting with some of the chicken stock every 15 minutes, for about 1 hour, 15 minutes longer. (An instant-read thermometer inserted in the thigh should register 160 degrees F.) During the last 15 minutes of roasting, stop basting with the chicken stock and brush the entire turkey with 1 cup of the pomegranate glaze. 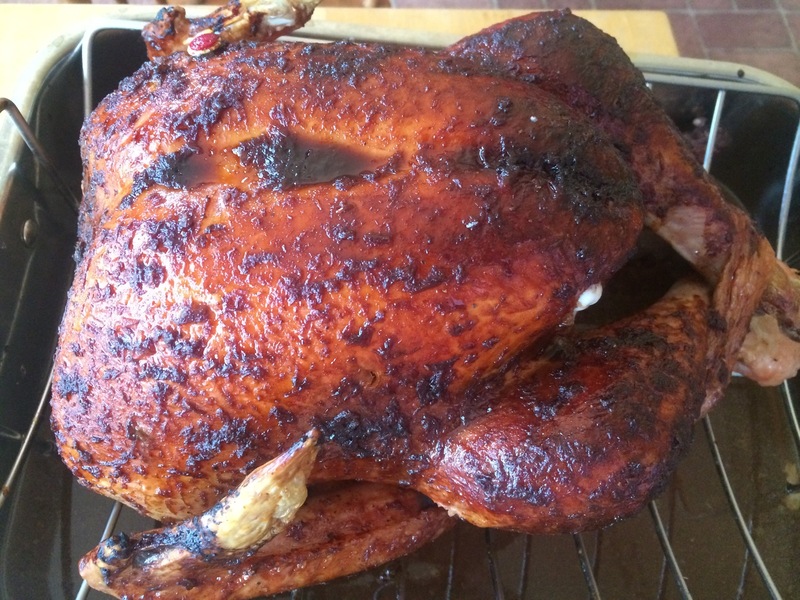 Remove the turkey from the oven, brush with the remaining glaze, loosely tent and let rest 15 minutes before slicing. Enjoy! Serves 10-12. Istanbul & Tehran have their Grand Bazaars, Jerusalem has the Shuk, and Barcelona has la Boqueria. It is a feast for the eyes! I couldn’t believe all the varieties of mushrooms. the vendors in witches hats, definitely did! Not only were the chocolate covered fruits beautiful, they were delicious! I sure do wish we had one of these in Delaware. What was the best meal my daughters and I had in Barcelona? It was, surprisingly, the one we and our fellow students made at Barcelona Cooking. Then we met our fellow students and instructor, and were divided into pairings for each tapa. I was paired with a lovely woman from Canada to make a fancy version of Patatas Bravas. Arielle was paired with a man from Switzerland for Gazpacho. And Emily worked with a woman from Switzerland on Sobrassada & Pear Pincho. Aside from learning to cook a few great dishes, I learned a number of things I did not know. Key among them was to use regular olive oil, not extra virgin, for cooking over heat. Why, the smoking point. EVOO breaks down over high heat and releases toxins, regular olive oil, made with both cold and hot pressings, stands up to the heat of cooking. EVOO is best used raw. Honestly, this blew my mind! I also learned that Arielle can use a kitchen torch without burning the house down. At home I will make a healthier version of Patatas Bravas cooking the potatoes in the oven, but here I will share a version of the recipe we used. Cut the tomatoes in half and pressing the flesh-side against the grater, grate the tomatoes into a bowl, discard the skin. Hollow out the center of each potato with a small melon-baller. In a deep skillet, heat about 2 1/2 inches of olive oil over low heat. Confit the potatoes by submerging them in the oil and gently cook until they are tender. Remove the potatoes from the oil and set-aside. Turn off the heat but leave the oil in the pan for the second round of frying. In another skillet, sweat the onion until the strips are tender but not browned (just starting to turn color). Then add the two types of paprika to the pan, as well as the cayenne pepper, and cook gently for two more minutes. Add the tomatoes to the pan and allow the mixture to simmer for 20 mins before blending and straining the resulting sauce (we didn’t strain the sauce). Set the sauce aside for when it is time to plate the potatoes. Make the alioli: blend the egg, garlic, and one cup of oil with a hand blender until thick and creamy, add salt to taste and set this sauce aside as well. Note: Hold the blender still until the sauce is about 3/4 emulsified, then you can move it around. To finish the patatas bravas fry the potatoes again, in very hot oil (around 375F) until crisp and golden brown. Once done, move them to a paper-towel-lined plate to drain. For serving fill each potato with some of the red brava sauce, then top that sauce with a dollop of white alioli. Serve and Enjoy!! Makes 8 servings, with extra sauce for other use. I did not grow sweet potatoes this year, but a nearby house did and had so many extras they sold them alongside the road. I bought a few and am putting them to good use. First up – Food Network’s sweet potato waffles with marshmallows. I have to admit that I had a little trouble with the broiler. When I first checked them, the marshmallows had not browned at all, but then I went about 10 seconds too long and over-browned some. No worries though, they tasted delicious!! I think I know what I am making for Lauren for her Christmas morning treat. Turn the oven down to 200 degrees F (to keep cooked waffles warm). Preheat a waffle iron to medium-high if there are settings (but it’s ok if there aren’t any). Whisk together the flour, baking powder, baking soda, cinnamon and salt in a medium bowl. Whisk together the buttermilk, 1/2 cup of the sweet potato puree, the oil, brown sugar, egg and egg white. Pour the buttermilk mixture into the flour mixture and gently stir until just incorporated (it’s ok if there are lumps). Lightly brush the top and bottom of the waffle iron with oil, then fill each section about three-quarters of the way full (there should still be some waffle iron showing). Close and cook until the waffles are golden brown and slightly crisp, 6 to 10 minutes. Keep the waffles warm in the oven or covered with foil on a plate while you repeat with the remaining batter. Switch the oven to broil, and drizzle each waffle with a little syrup and 1/4 cup mini marshmallows. Broil until golden, 15 to 30 seconds. These are so delicious, the first thing I need to do is acknowledge Rachael at La Fuji Mama (lafujimama.com) for the recipe. 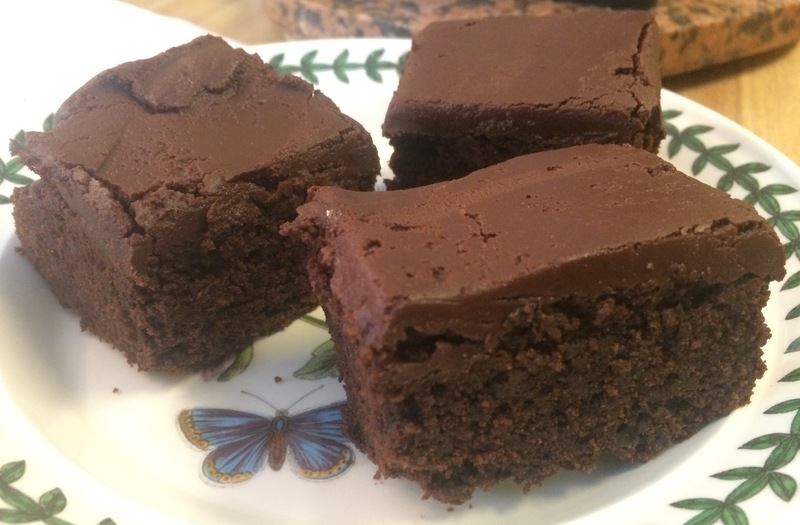 It was so good and made so many brownies that the first thing I did was give half of them away! To keep myself from eating them, of course. I just chanced upon this recipe. I had bought buckwheat flour for pancakes and was searching for other uses for it. All I had to see was “Nutella ganache” and these were a must-make. They are extremely rich and satisfying. Perfect with a cold glass of milk. And I have to say that not only were these delicious, they were so easy to make. Thank you Rachael! Preheat the oven to 350 degrees Fahrenheit. Line a 9×13-inch baking pan with foil and lightly grease the foil. 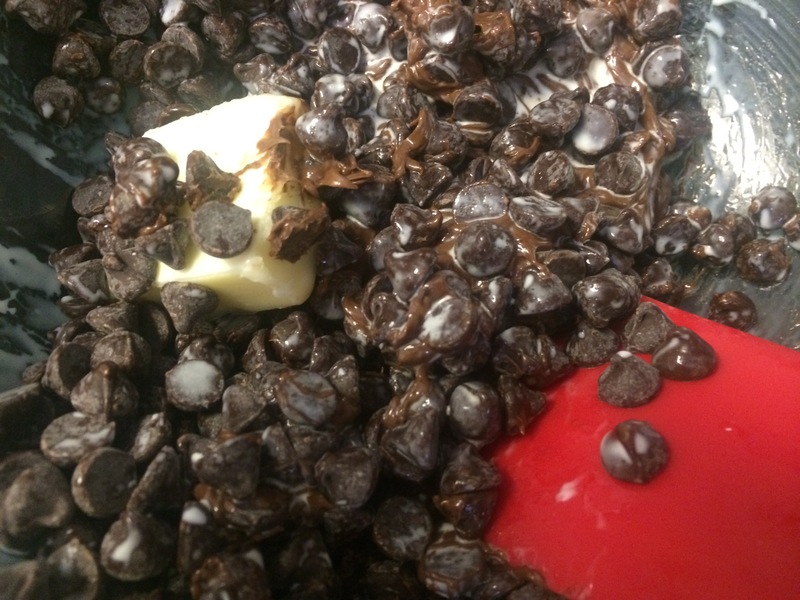 Melt the butter and chocolate in a medium-size saucepan over low heat, stirring often. Pour the mixture into a large mixing bowl and whisk in the sugar and vanilla. Then whisk in the eggs, 2 at a time. In a separate bowl, whisk together the flours, cocoa powder, baking powder, and salt. Add 1/2 of the flour mixture to the chocolate mixture, and stir well. Add the other half, and stir until just mixed. Pour the batter into the prepared pan. Bake for 35 minutes, or until a toothpick inserted into the center comes out with a few moist crumbs attached. Place the pan on a wire rack to cool. While the brownies are cooling, make the ganache. Combine the ingredients in a double boiler or in a microwave safe bowl. Melt together and combine. Pour the ganache over the top of the brownies and spread gently. Place in the refrigerator until the ganache is set. Cut into 30 servings and Enjoy!